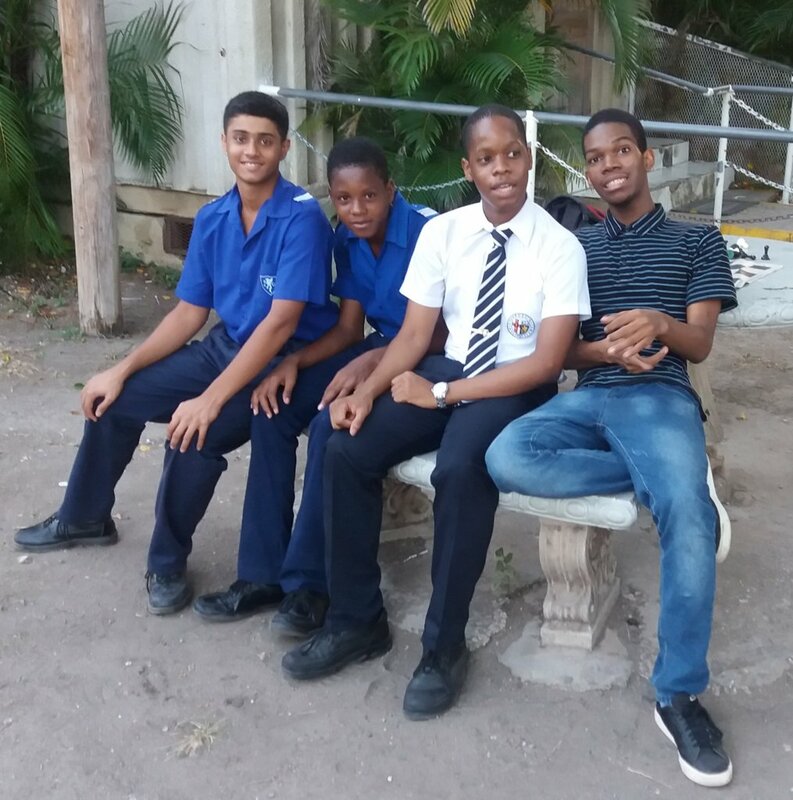 (L-R) Nikit Gupte (brd 3), Christopher Lyn (Brd 1), Tevin Campbell (brd 2), Rameze Thorpe (Brd 4).Gentlemen,Meet the Jamaica College A-Team which tonight was 3rd in the Country in Chess behind St Jago High (6th time Champ), & St Catherine High School (2nd consecutive runner up finish). JC finished points ahead of all Corporate Area Urban teams and received the Top Urban trophy. This was the 6th Urban Title for JC, (1982,83,84,85, 2017 & 2019). Board 1: Christopher Lyn, transferred from Excelsior High, in the summer, he was unbeaten on 5,5pts from 6 games, including he got our only point against St Jago beating FM Joshua Christie. He won best Board 1 prize. Now in 4th form, he was formerly at St Judes Primary. 1st year playing for JC. Board 2: Tevin Campbell, JC from 1st form. Now in 5th form he was also formerly at St Judes Primary. 4th year on A-Team. Board 3: Nikit Gupte, JC from 1st form. Now in 6B, citizen of India. 5th year on A-team. Board 4: Rameze Thorpe, joined JC in 6B form from Wolmer’s Boys. Also formerly at St Judes Primary. 1st year playing for JC.The St Jude boys played together years ago in the Prep/Primary Team championship.We want to thank you for different things you did to inspire and assist us. Chess in Jamaica started officially in 1969 with the founding of the Jamaica Chess Federation with Enos Grant, an Attorney being the first President. The Jamaica Chess Federation became a member of the World body of Chess (FIDE) in 1972. The National High Schools Chess Championships had its first finals in 1975. 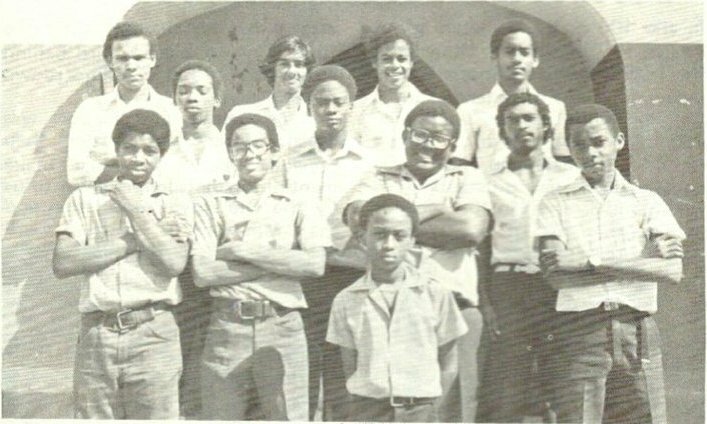 Conrad Grant, son of Enos Grant, started at JC around that time, and by 1982 along with Michael Siva (Captain), David Nichols, Stuart King, Malden Miller, and others Jamaica College won its first National Chess Championship then known as the Worker’s Bank All-Island High School’s Chess Championships. Jamaica College was to repeat again as Champions in 1983 under the Captaincy of Malden Miller, with Stuart King, Terence Lindo, Wayne Henry, Zak Mars, & Colin McKenzie. JC was once again in the Finals the following year 1983 under the Captaincy of Terence Lindo, with Stuart King, Mark Crawford, Zak Mars, & Colin McKenzie. This time we shared the Title with St. Jago High. In 1984 under the Captaincy of Stuart King, with Mark Crawford, Zak Mars, & Colin McKenzie Jamaica College once again made the Finals again sharing the title this time with Kingston College. 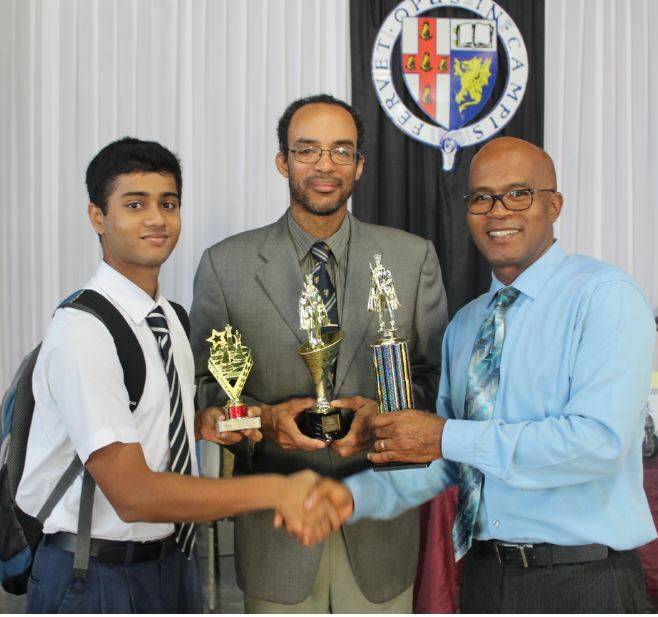 The Jamaica College Chess team was also awarded a trophy for the best Urban team in those victories as the rural title went to the respective top school from the Rural area. In 2010 the JC Chess club was revived under the guidance of National Master Geoffrey Byfield and in the 2012-2013 school year, the school returned to the National Chess Championships and qualified to the Quarter-Finals of the Urban Chess Championship this time Sponsored by RBTT Bank. In September of 2013 former Captain and member of 2 victorious Championships teams, Terence Lindo, who is now a FIDE National Instructor as well as a FIDE International Organizer, returned to his alma mater and took over the chess program. Under Coach Lindo the chess club grew steadily and improved their performances. The A team returned to the Quarter-Finals of the Urban Area Chess Championships in 2013-2014 after surviving a very difficult playoff against Meadowbrook High. The 2014-2015 season was a standout year as both the JC “A” and “B” teams qualified to the quarter finals with the “A” team making it to the semi-finals. 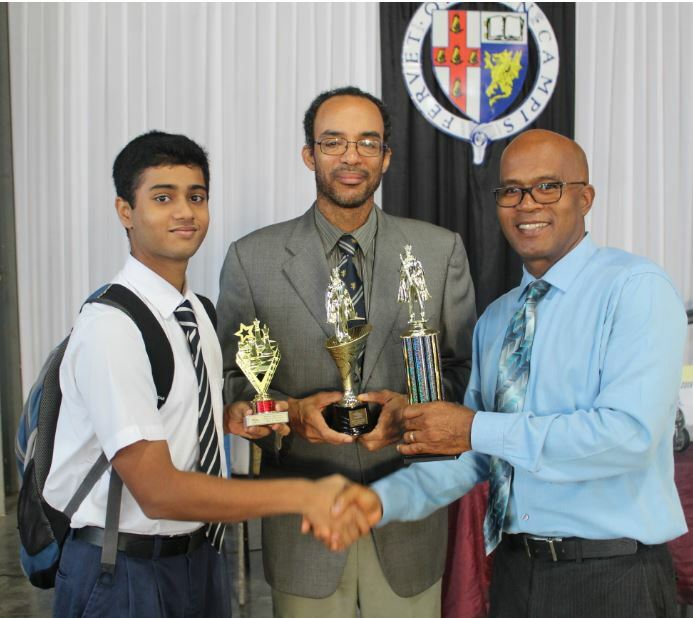 The 2016-2017 was the year the hard work paid off as the JC “A” team was 4th in the 16 Team Finals of the PCJ/Petrojam National All-Island Chess Championships and was once again the top Urban School winning that award for the 5th time in our history, this time after a 33 year drought. In the 2017-18 the “A” team finished 10th overall in the Finals of the PCJ/Petrojam National All-Islands Chess Championships relinquishing our place as the top Urban Chess School. Michael Siva first won in 1980, followed some time later by John Tobisch and Jonathan Orgill. The next event is the Finals of the National High School Chess Championships 2018/19 which will be 2 days at the PCJ Auditorium, Feb 28th & March 1st 2019 starting at 9:30 a.m.
Our current (2018/19) “A” team is Christopher Lyn local rating (2024) board 1, Tevin Campbell (1636) board 2, Nikit Gupte (1643) board 3, and Rameze Thorpe (1602) board 4. To join the club come to room 4H and speak to Coach Terence Lindo 876-804-3728 JC.Chess.Coach@gmail.com. We meet Monday, Wednesday & Thursday 2:30pm to 4:00pm. 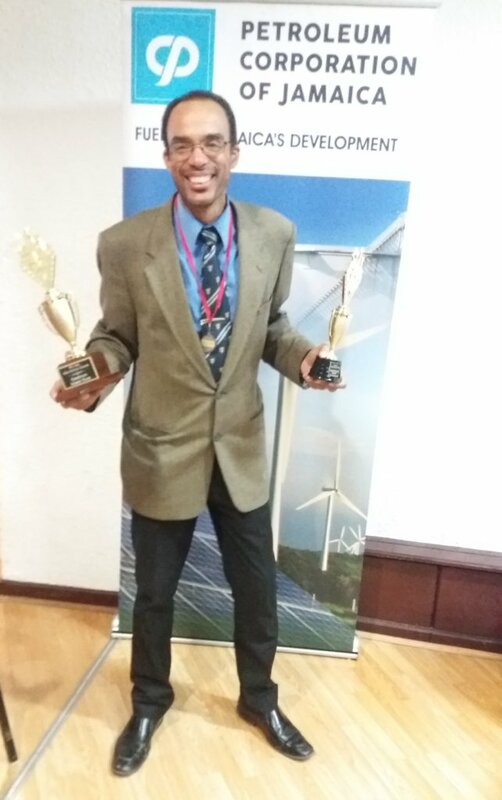 Coach Terence Lindo holding the PCJ/Petrojam National High School’s Chess All island 4th place trophy (left hand) and the Top Urban School Champion trophy (right-hand). 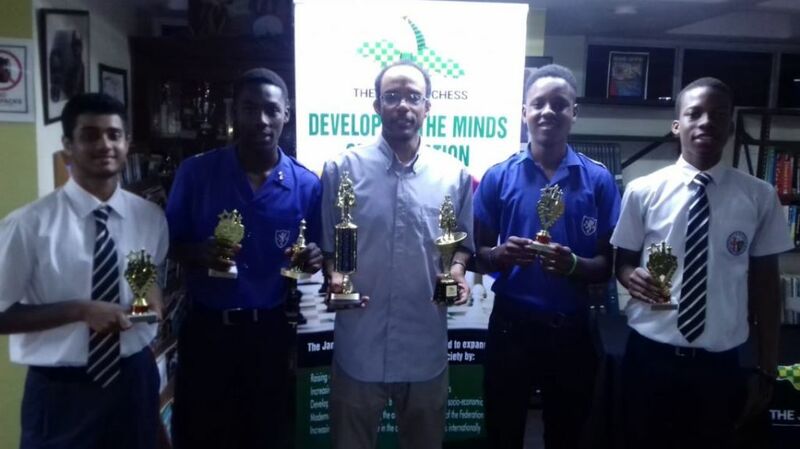 It was the first time since the 1984-85 Season that Jamaica College was the top Urban Chess School. 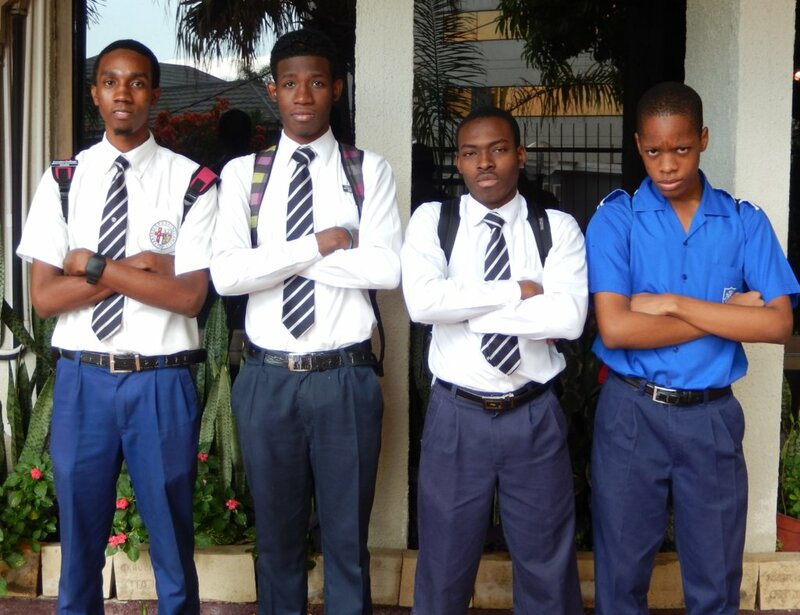 The JC “A” Team which upset Wolmer’s Boys and made it to the Semi-Finals of the Urban Area Chess Championships 2014/5.